Rituals already fill our lives. Some have become so common—our morning cup of coffee, friendly hugs hello, afternoon walks—that we hardly pay attention to them. However, even the most ordinary repetitive act can add meaning to your life, especially when negativity seems to surround you. You will soon discover how to transform everyday activities into mindfulness exercises. 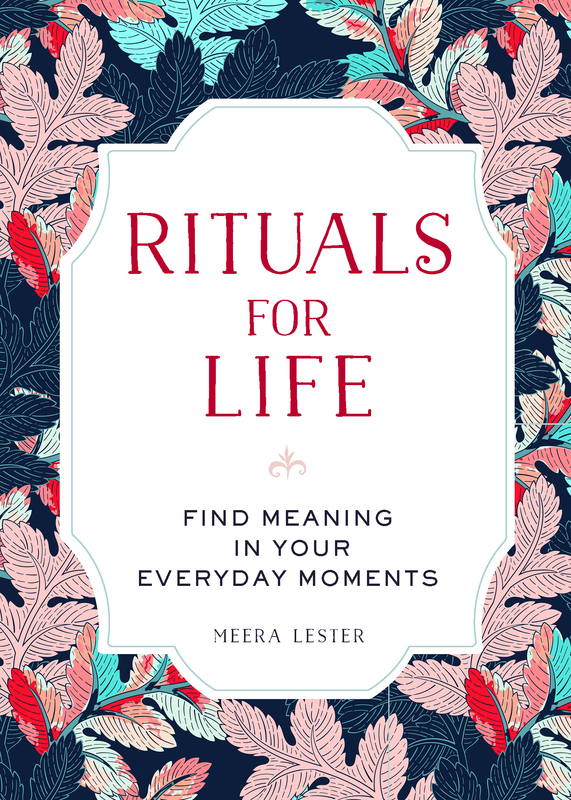 By instilling purpose into your actions, you will be able to rely on them as a means of self-fortitude, drawing on these rituals to feel centered, connected, and grounded in a chaotic world. Do you avoid spending time at malls, performance venues, sports arenas, and other crowded places because being around lots of people wears you down, makes you feel stressed, or causes you to feel ill? When someone calls to discuss their toxic issues, do you take on their distress? Do you absorb energies that signal fatigue, anger, pain, anxiety, or sickness in someone else when you pass them in the grocery store, the gas station, or large group meetings with a spiritual teacher? If you answered yes, you might be a natural empathic who is taking on other the energies of other people. To protect yourself in crowds, put distance between yourself and others. Time in nature, sometimes referred to as ecotherapy, fosters well-being in body, mind, and spirit. According to a 2007 study in the United Kingdom (Mind.org) when participants who suffered from seasonal affective disorder (SAD) and depression went for a green or country walk, 71 percent of them felt less depressed. The healing vitality and presences in nature can alleviate stress, increase creativity, and empower you to reconnect with the ancient power of healing that nature holds. Keep a clover or flower in your pocket to remind you to return to nature. Take a walk in green space or do a weekly hike in the mountains, out on the prairie, along a river or lake, down a country road, or across a field. Ritualize your excursion by practicing mindfulness. Take time to breathe fresh air. Run your fingers in splashing water from a waterfall or trace the boundary of a warm ancient stone. with adversity feels burdensome, and the situation too complicated to be easily resolved, try a simple ritual for personal protection and empowerment. The Sri Yantra is a sacred, mystical symbol in Hinduism in the form of a geometric diagram featuring nine interlocking triangles. Meditation on the sacred geometry of Sri Yantra protects from harmful forces and aid in attracting wealth, power, and success. When you want to focus on the positives in your life, a gratitude journal can be a powerful tool. Scientific evidence supports the notion that people who are grateful tend to be happier than those who aren’t. When you focus on happiness-boosting activities that include random acts of kindness you do for others, it enhances your levels of gratitude. Maintaining such a journal can lead to greater optimism as you count your blessings. Write in the journal at least once weekly. Write three things for which you feel grateful or bring you joy. progress, you can look back over your entries and feel uplifted and fulfilled by all the goodness in your life. Purchase or make a journal. Rub your palms together to create energy as you hold in your mind thoughts of thankfulness and appreciation for the wondrous world. Hold your palms facing down over the journal to impart the positive energy into the journal. against the summer heat and drops its leaves in winter to let the sun heat the building’s exterior and brighten the dark interiors. Or the way the snow glistens in moonlight. Or the orb-spinning spider’s intricate web that had as its beginning a single thread. Perhaps you could look through the eyes of a child at the full moon rising, the drops of rain in a puddle, or the rainbow’s appearance in the sky after the storm and let the wonder rise in you to fill your heart with gratitude. Use a red ribbon to hang a crystal from an eastern-facing window where it can act as a prism for the sunlight. Give it a gentle spin to bring dancing rainbows into your room. When you are having a down moment, go to the crystal and be reminded of the rainbows in your life for which you are thankful. inspiring feelings of happiness and gratitude. At a drive-through coffee facility, one person buys their morning coffee and spontaneously decides to pay for the coffee of the driver in the car behind her. That triggers surprise and gratitude in the second driver, who decides to pay for the third. And so on down the line of cars, the ripple effect begins as one driver after another is paying for a coffee order for perfect strangers. When you start a ripple effect with some small gesture, you don’t always get to see where your action might lead. But do it anyway. Make it your daily ritual of giving back or paying it forward: offer change to someone short on bus fare. Help someone get the parking space you’re about to leave. Buy lunch for a homeless person. Record these actions and your emotions in your journal. Feel inspired to do more. You want live a more intentional life and make a positive difference in the world. Be guided by the power that comes from listening to your inner voice of reason and guidance. Spent time in meditation, seek soul guidance, and then use your power on the path you choose. Maybe your work will be volunteering on a Mercy Ship that brings healing and hope to the world’s forgotten poor. Perhaps you’d like to work to end childhood hunger through an organization such as Feed the Children. Or maybe your heart’s aspirations align with the emergency food and healthcare needed by the world’s children in crisis and their mothers in developing countries. Do a pranayama known as alternate nostril breathing (Nadi Shodhana) to calm the mind and balance the energies in your body. Sit in a cross-legged pose. Place your right thumb against your right nostril. Inhale through the left nostril. Close the left with your ring finger and release the right. Breathe out through the right. Close. Use thumb to close the right nostril. Breathe out through the left. This completes one round. Do two rounds. Meditate on being a light bearer on the planet. Make your intention declaration. Emotional upheaval can show up during any point in your life as a result of past emotional trauma, sudden changes, life-threatening illness, death of a love one, a major move, or post-traumatic stress. and reactions that can surface during an emotional upheaval include anger, anxiety, crying, dizziness, diarrhea, hyperventilation, and stomach tightness. When psychological distress sets in as a result of some major life change, try to accept what you cannot change. Exercise can help temper the flood of brain chemicals unleashed and slow brain waves. Media, a division of Simon and Schuster. Used by permission of the publisher.